Above: Cistus clothes an Algarve slope. Picture: Rob Petley-Jones. From April onwards large areas of the Algarve are dominated by the flowering of the many species of Cistus that flourish on hill slopes, in abandoned farmland and along the coastal strip. In common with the rest of the Mediterranean region, the Algarve has many more species of Cistus than the casual observer could imagine. Sorting them out is challenging, and new species and hybrids are still being discovered adding to the confusion. 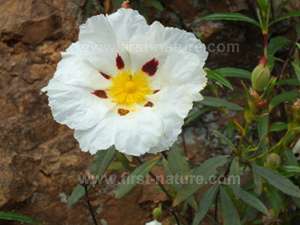 Cistus plants are members of the Cistaceae family of plants also known as the Rock Rose family. The plants we normally refer to as Rock-roses nearly always have yellow flowers whereas Cistus plants have pink or white flowers. 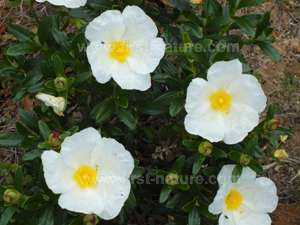 Cistus flowers are large and beautiful, and are bisexual producing both ovules and pollen . The flowers can be either solitary or in clusters. 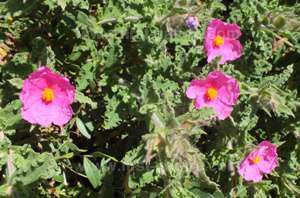 Cistus plants are tough and have leathery (sometimes sticky) leaves. The seeds, which can lie dormant for long periods of time, have very hard coatings. As a result, they are well adapted to the frequent wildfires that wipe out huge swathes of trees and shrubs in the Mediterranean. Fires can actually soften the seed coatings and stimulate the plants into growth. As a result Cistus is often the first plant to recover after a fire giving it a head start against other plants with which it must compete for land and food. Another weapon in the Cistus armoury which helps with its survival is its ability to form symbiotic relationships with fungi which live in the soil. This relationship involves the fungi penetrating the Cistus roots and improving their ability to absorb water and nutrients from the earth. Some of the fungi species even have the ability to kill other plants in the area thus giving their host an even better chance of surviving and colonising additional territory. Below are six of the Cistus species which are most commonly encountered on countryside walks, both along the coast and further inland. 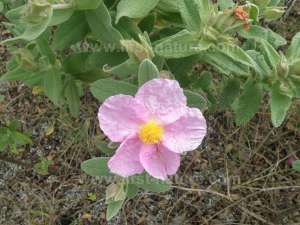 This is the more common of the pink-flowered Cistus species, and is characterised by is greyish looking leaves which are covered with soft hairs. 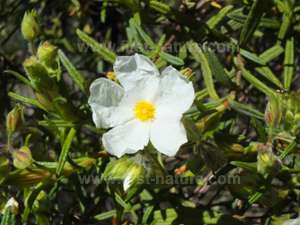 Grey-leaved Cistus is found at low altitude, frequently colonising large areas of land. Often confused with Cistus albidus, this plant can be identified by the distinctly wavy margins of the leaves. Unlike Grey-leaved Cistus, Cistus crispus is tolerant of a wide range of altitudes and is found high in the hills as well as lower down in the Algarve. By far the most common of the Cistus species found in the Algarve, Gum Cistus is nonetheless confusing to identify because the flowers occur both with and without the maroon blotches which many of us think are the defining feature of the plant. Gum cistus is not fussy about its habitat and grows high in the hills and low down on the coast. Sometimes confused with Sage-leaved Cistus due to their similar-looking flowers, this plant has narrow, slightly sticky leaves which, on close inspection, are very different from those of Sage-leaved Cistus. It grows at low altitudes throughout the Algarve, but is localised and less common than Sage-leaved Cistus. 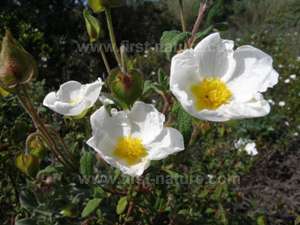 This plant is very similar to Gum Cistus, but always has unspotted white flowers. It is a shorter shrub than Gum Cistus but it is unclear if this is because it only grows at Cape St. Vincent which is subject to very strong winds most of the year. Classed as a rare endemic species of Cape St. Vincent there is still much debate as to whether or not it should be regarded as a separate species. 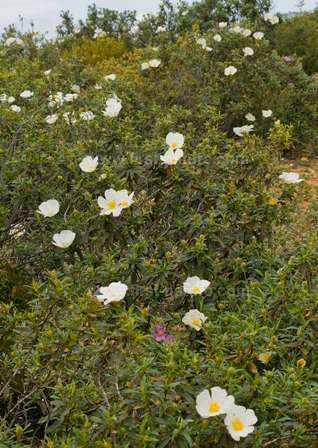 This species of Cistus is common throughout the area and tolerates a number of habitats. It is characterised by its leaves which look very similar to the well known culinary herb called Sage. Its flowers usually occur in clusters.